With higher volumes, automated business suite was need of the hour for Shopnineteen.com. Vinculum Solutions Pvt Ltd is an IT products and services company with expertise in retail and supply chain domain. The company works with the aim of bringing operational efficiencies to retailers with specialties including retail, FMCG, logistics, ORPOS implementations, Oracle Retail RMS implementations, Oracle Retail AVT, Vin MMS, Vin BOS, POS, Vin Commerce Products, MDM, WMS Implementations, Mobile Apps, Queue Busters and Hand Held Solutions. It recently provided its solutions to one of the emerging e-retailers, Shopnineteen.com. The portal offers latest fashion for teenagers and women. Shopnineteen.com is scaling up its business, with its brand reaching a broad range of customers across cities. The project kick started on 21st May 2012, and within less than a month, that is on 11th June 2012, it was completed. Shopnineteen.com, being a recent entrant to the e-retail arena, was seeing problems in the areas that involve logistics, fulfilling orders on time, avoiding out of stock scenarios, avoiding manual order fulfillment and also report generating systems, and receiving real time updates on orders by building integration between the website and third party logistics. They were also looking at better sync between the head office and warehouse operations along with a strong merchandising system to avoid mismanagement of SKUs at the warehouse. The need of having better solutions came when the e-retailer was looking at larger number of order on an average every day. Vinculum offered the ERP system, eRetail, a complete end-to-end retail suite, implemented Master Management modules for business functions like tax management, merchandising management, vendor & customer management, user management, etc. 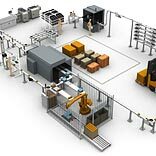 The solution also delivered complete order fulfillment functionality aligned to the business requirements along with automated operational and warehouse processes such as receipt, picking, packing and shipping process. This helped the e-retailer in minimum intervention of business users, thus reducing the manual errors. While SaaS based model helped them to access the system hassle-free with no installation required. Integration of 3rd party logistics, such as Bluedart, Aramex and Chotu.in, resulted in auto-allocation of airway bill numbers along with validation for serviceable locations. Reports management system was also enabled for making customised reports, helping the business users keep track of transactions as the data was available in real time and action could be taken based on accurate information.